Only breeze® mattresses are cool when you lie down, cool when you fall asleep, and cool ALL. NIGHT. LONG. Our new breeze® mattresses were designed in our thermal laboratory to help manage the micro-climate between your mattress and your covers for a cooler, deeper sleep all night long. Research suggests a cooler sleep environment helps you fall asleep faster and stay asleep longer with less tossing and turning…for better quality sleep. 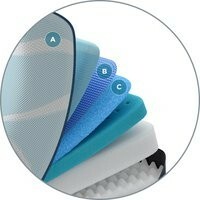 The breeze® system of cooling technologies promotes extreme breathability and noticeable surface cooling. A. Cool when you lie down. Our SmartClimate™ Dual cover system feels instantly cool. For the next 20 minutes, you’ll feel the cooling sensation of our advanced PureCool+™ Phase Change Material. 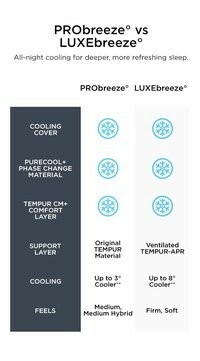 Over the next 8 hours, the extremely breathable comfort layer, TEMPUR-CM+	™, allows the heat and humidity normally trapped under the covers to be cycled out of the mattress. Twin Long - 38" x 80"
Double - 53" x 74"
CA King - 72" x 84"
*Dimensions of each individual mattress may vary.